has the naughty thumb of science prodded thy beauty? squeezing and buffeting thee that thou mightest conceive gods? thou answerest them only with spring. Ostara is the spring equinox, when the days and nights are equal length. The spring equinox usually falls around March 21st or 22nd. Ostara corresponds roughly with the Christian Feast of Annunciation, also called Gabrielmas, and the English quarter-day called “Lady Day”, both of which fall on March 25. Depending on the year, Ostara may or may not fall near Easter, which falls on the first Sunday following the full moon following the spring equinox, and near Passover, which falls on the new moon following the spring equinox. The themes of the Neo-Pagan celebration of Ostara are similar to the Christian themes of Easter, i.e., new birth, although the Christian motif of the sacrificial death is not celebrated by Neo-Pagans until the autumn harvest. There is no universal outline for the Wheel of the Year. Every version differs in the details of the Mythos and which events are assigned to which point on the Wheel. According to one version, at Ostara, the Bright Youth becomes the Stag King and courts the Flower Maiden. The God and Goddess mate and the Goddess conceives the Sun Child that will be (re-)born at the winter solstice. 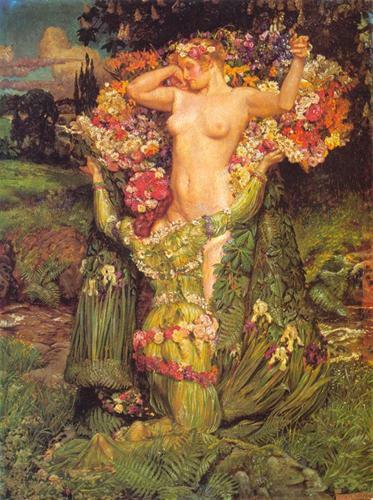 The Flower Maiden reaches womanhood and is transformed into the Lady of the Beasts, reflecting her new sexuality maturity. The Stag King and the Lady of the Beasts are betrothed.